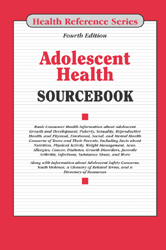 Adolescent Health Sourcebook, Fourth Edition, offers researchers, parents and teens basic information about growth and development during adolescence and related safety issues. It discusses the importance of routine medical care, adequate nutrition, physical activity, and sleep. Chapter 11– Calcium, Vitamin D, and Teens. Section 14.3– Tips to Help Teens to Lose Weight. Section 15.2– Why Do Teens Get Cosmetic Surgery? Section 22.1– Why See a Gynecologist? Section 28.2– Could I Get Pregnant If…? Section 28.4– Teen Parents. You're Not Alone! Section 59.1– Facts about Teen Drivers.